This is a Story of our game Samurai the hunter: The game is published on Play Store and Facebook game center. Once upon a time, there was a hunter tasked with the role of protecting the world from invasion. As he sat eating his sweet roasted meat in the forest, he heard voice from heaven commanding him to wake up and protect his land. The man and his ignorance cause the heaven to issue a curse on the land. Trees and other plantation withered. Rivers and oceans dried up. The land was left like a desert. No food to eat, no water to drink. Days, weeks and months passed and no change was visible on the land. As he was lying down, voice came from heaven again. This time it was a warning on the impending invasion by dinosaurs. The first little dinosaur showed up at his farm. He thought this would end in a matter of days. As he slept, he noticed more dinosaurs outside his house. It was late at night and he would not risk his life. When he woke up the following day, all his people were dead. Dinosaur were now taking their place. He was only armed with a sword. He tried to fight off the dinosaur to no avail. He could not ask for help from the heaven since he had already ignored the warnings. Year after year, the number of dinosaurs grew fast that the entire land was full of dinosaurs. The land turned in blue ocean of dinosaurs. He was at risk of dying. If he was not attacking, the dinosaurs would attack and kill him. He was to work tirelessly and protect his land. On mobile, to swipe right - left - up - down to move him across the screen. 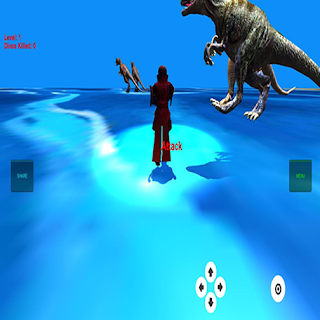 Tap on the screen to help him eliminate the dinosaurs. Or use the provided buttons to make the moves. Get the game here. On computer (Facebook version), use the keyboard arrow keys to move and space bar to attack. You can also use the provided buttons for the same. Play online here. You can follow the number of dinosaurs you have eliminated. You lose if you come across a dinosaur and don't attack. You can share your performance with friends on Facebook and twitter. The story ends when you completely wipe out all dinosaurs. How many can you eliminate? Will the game end before you accomplish your mission? What if a friend beat you in the game?